Have the authentic look of wood without the upkeep it takes to maintain its beauty. Never worry about animals scratching your floor or be on edge about what your kids could be spilling again. With laminate flooring from 2 Day Flooring, you can feel confident about your flooring decision. Due to its scratch and stain-resistant properties, laminate flooring has become one of the most sought-after floor types for homeowners throughout Tampa. Good for high-traffic areas, laminate flooring is a wonderful option that is both durable and beautiful. Available in a variety of styles, colors, and textures, 2 Day Flooring offers our customers a complete laminate flooring installation for an affordable price, transforming the ambiance of any room with ease. 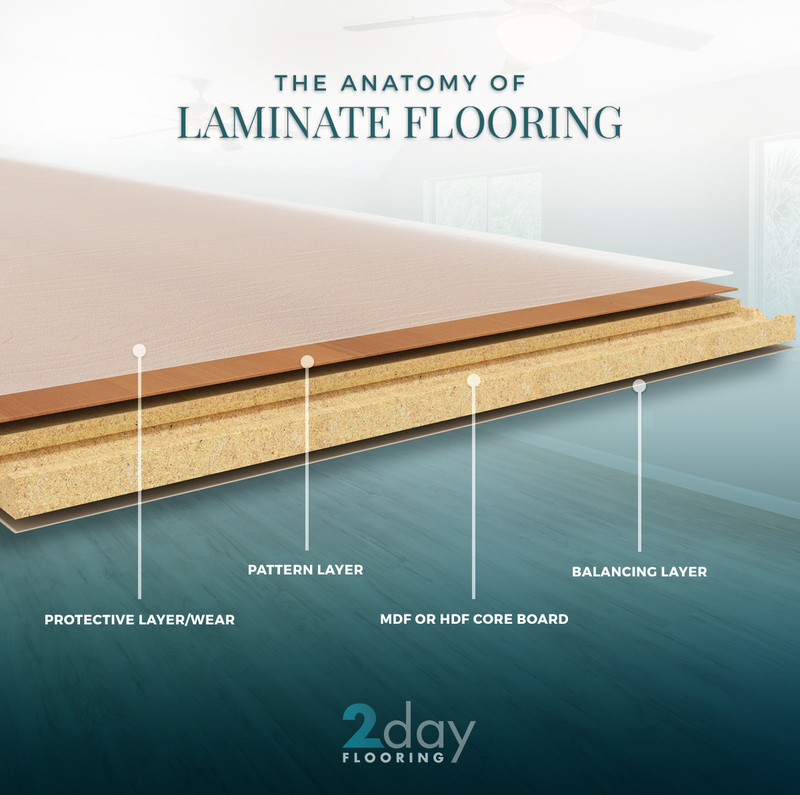 Here at 2 Day Flooring, it is our goal to provide you with a complete laminate flooring installation, taking the hassle and stress out of updating your floors. Your laminate flooring is made up of several layers to ensure that it has the appearance of natural materials like wood, stone, or tile, but that it also maintains its durability and resilience. The balancing layer of your laminate flooring is the very bottom layer. It works to balance the other layers and prevent the bending or collapsing of your floors. It also prevents moisture from absorbing underneath. The next layer is MDF or HDF core board. This medium-density fiberboard or high-density fiberboard is a water-resistant layer and is the core of your laminate floors. This is the thickest layer of your flooring and is the part that is notched so the boards can lock together during installation. The pattern layer is the first layer that’s visible from the top. This layer contains the appearance of the material that you’ve selected. It is essentially a photograph of the material you are trying to imitate and has been layered with a melamine resin. This layer uses realistic colors and a pearl-sheen ink to give the photograph depth and realism. Patterns may repeat, but the most common technique is to take a large photograph and break it into several different segments so that the pattern has a lot of variety and looks more natural. 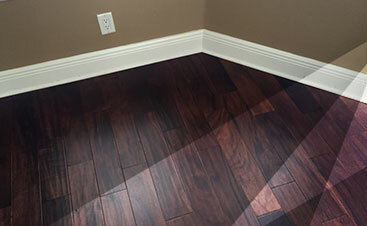 This method is how your laminate floors appear realistic in comparison to the actual material. The top layer of your laminate flooring is the protective layer or the wear layer. It is usually made of an aluminum oxide clear coat. The material of this layer seals all of the layers beneath it and prevents moisture from soaking into the layers below. This layer is available in different levels of gloss depending on the finish you’d like. Because laminate flooring is created using photographs, there are a variety of materials that you can pick from for your laminate floors to mimic. Different material photographs can also have different finishes and textures to better represent the real materials. There are a lot of options available when it comes to laminate flooring that looks like hardwood. This appearance can either be created through printed photographs or with actual hardwood veneers. With the latter option, instead of a photo of wood grain, there’s actually a thin layer of wood applied to the core board and topped with an acrylic finish. If you choose this style of laminate, it can be restored by sanding and refinishing the surface after several years. Planks for this type of laminate flooring can range in length, but they are usually a little wider to reflect the width of planks used for hardwood flooring. 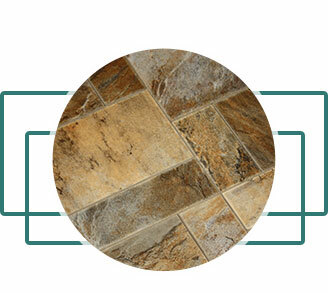 Stone laminate flooring is a beautiful alternative to real stone because it imitates the original appearance so well. Stone laminate flooring also uses photographs of the original material, but ridges and indentations are added to the surface of the pieces to give the laminate floors a more authentic texture and appearance. The shapes and sizes of stone laminate flooring have a greater variety as well in order to mimic the variety of shapes and sizes available for real stone. Tile laminate flooring also uses photographs of different tiles. The finish and texture looks like genuine ceramic tiles. Laminate flooring made to look like tile is available in planks that are 12 to 16 inches wide and 3 to 4 feet long, or it’s also available as individual tiles in 12- to 24-inch squares. This style is less popular because many people are looking for a flooring option that looks like natural materials. However, plastic laminate floors offer a lot of variety and versatility. This style will always use a photograph in the layering of the laminate planks, making them the perfect option for someone who wants their floors to have a more unique appearance. There are a variety of methods to install laminate flooring. Many of these methods exist to make it easier for people to install their laminate flooring themselves, however, we do recommend you hire a professional like 2 Day Flooring for the best results. 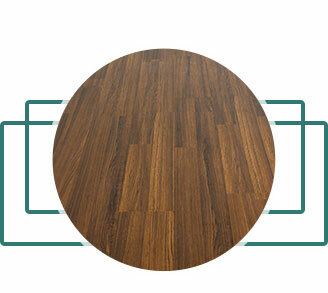 Glueless laminate flooring: This type of installation doesn’t require planks to be glued, but instead requires a specific method to get the planks to lock together. Glued laminate flooring: This process is more costly and takes longer than the glueless method, but it creates a stronger floor because planks are bonded together. 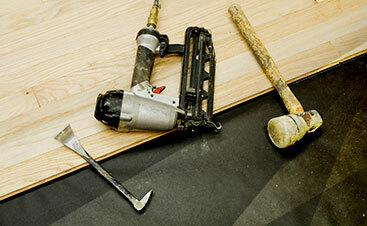 Pre-glued laminate flooring: Applying laminate flooring this way requires that the planks already have glue on them. This method has a couple of different techniques depending on the type of glue that has been applied, but it is a quicker way to install floors. Underlayment laminate flooring: This type of laminate floor installation is another glueless method. Each plank has a tongue and groove so that they can lock together. This method also reduces sound levels when you move across your floor. 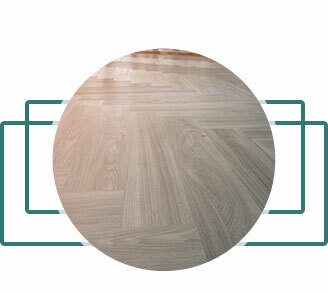 There are plenty of tutorials online to teach you how to use these installation methods, but for quality results it’s best to hire a company like 2 Day Flooring that has years of experience installing a variety of floor types, including laminate flooring. Your laminate floors may look like genuine wood or stone, but cleaning and maintaining them is a much simpler process. You can clean your laminate flooring simply by sweeping and mopping with a damp mop regularly. You can also use a vacuum on a setting that is optimal for bare floors instead of carpet. Cleaning solutions are also safe to use on laminate flooring. You can use store-bought or homemade laminate floor cleaner. A great homemade solution for laminate flooring consists of equal parts vinegar and water. You can also mix equal parts vinegar, water, and rubbing alcohol if you’re trying to disinfect. Keep your solution in a spray bottle and use it on tough stains or small areas. If you purchase a cleaning solution, make sure that it’s specifically for laminate flooring. If you buy cleaners for linoleum, tile, or hardwood, you may end up with a filmy residue on your floors that will make the laminate look dull. 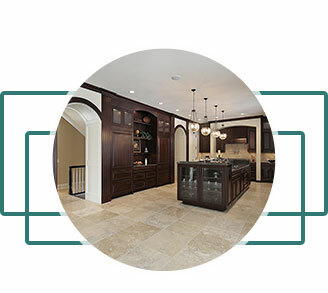 When you work with 2 Day Flooring, you can trust that we put your needs first at all times in order to maintain communication, ensuring a prompt, affordable, and effective laminate flooring installation experience. Providing superior service is not just our mission — it’s our promise. Projects big or small, we can do it all. Whether you are looking to update your flooring because it no longer matches the aesthetics of your home, or you need a simple way to increase the value of your property, we provide you with an endless selection of high-quality laminate flooring options. For your free in-home estimate or to get your questions about floor installation answered, get in touch with us by filling out the form below.